The answer can be found (buried but not dead) within some new terms you may need to add to your vocabulary, the first of which is “controllerism” which is best explained by a video which at first seems to have little to do with those ancient black vinyl discs. There is something going on in that video which gets to the heart of why the supposedly obsolete ‘Phonograph turntable’ paradoxically represents everything which is current and fresh in our technological universe. Why is this question becoming ever-more important? Well give you a generous cut of the revenue! Because we now live in a world which demands that we use, cope with and possess things which are so unimaginably complex to make that we have no possibility of involvement in producing them; products which, in the context of our own personal experience, might just as well have been imported from mars. We are so remote from the sources of so many of the things we use today that the usual ‘obligation to conformity’ in the way that we use them is more a matter of convention and convenience rather than compulsion and enforcement. In this context, terms like ‘repurposing’ and ‘recycling’ have an air of respectability that contrasts markedly with the stigma historically associated with ‘meddling’ and ‘tampering’ that manufacturers and authorities have successfully instilled in our collective cultural mindset. The desire to ‘recover our connectedness’ to the things around us can be addressed by changing those things in such a way that we can ‘put more of our identity into them’ rather than merely just owning them, which is all that our consumer culture expects us to do. 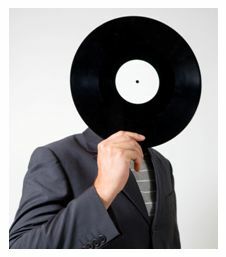 Fundamentally altering the function of something complex, rather than just changing its appearance, is what ‘the hacker as transformational artisan’ is all about, and the makeover of the venerable Gramophone from a humble playback device into a widely adopted musical instrument (turntablism) is an iconic example of this (although the ‘transformational aspect’ of the ‘turntable as musical instrument’ is more evident in the ‘playing’ rather than the making these days, now that the playing has become the device’s primary function). Why turn the turntable and disc into a musical instrument? In response to these criticisms, I present the undeniable wizardry of Reggie Watts (still not any evidence of any vinyl records in this video either, I’m afraid, but I think you’ll get the idea). There’s one other ‘controllerist’ issue associated with turntablism (or the other associated features that Reggie uses, such as beatboxing, sampling and looping) and this is a sense that it is all in a certain way ‘out of control’: a certain element of the improvisational dimension which exposes us to aspects of the personality and experiences of the ‘controllerist’ no less revealingly than the ‘control’ aspect does, and no less so than with any other music or art form.